Meals on Wheels -La Popote roulante in Ottawa is known for its friendly and enthusiastic volunteers who come from all walks of life, and this includes volunteer support from corporate teams in the Ottawa area. Corporate volunteer teams are much like any other Meals on Wheels volunteer, except they are formed by members or employees of a recognized company or organization in the community. More often than not, corporate teams help with deliveries during their lunch hour break, heading back to their office to continue on with their workday afterwards. One of our corporate teams is from MBNA, a division of TD Canada Trust and will be soon approaching their 20th year with Meals on Wheels, volunteering since 1998. This team currently volunteers three Mondays of every month, delivering a route picked up at the CHEO hospital. Their consistent volunteer support is invaluable to seniors and adults with disabilities in Ottawa. The MBNA team in Ottawa currently has 13 active meal delivery volunteers, who are each able to donate 6 hours to volunteering per month. These volunteers deliver meals in pairs, one as a driver and the other as a server. The short lunch time delivery means these members are able to make a positive impact in their community without sacrificing too much time away from the office! In addition to delivering meals in their community, a few members have been key in supporting Meals on Wheels financially through the TD Bank Group Volunteer Grant Program. This program provides active and retired employees of the TD Bank Group the opportunity to receive a $500 grant for a charitable organization they are personally committed to. 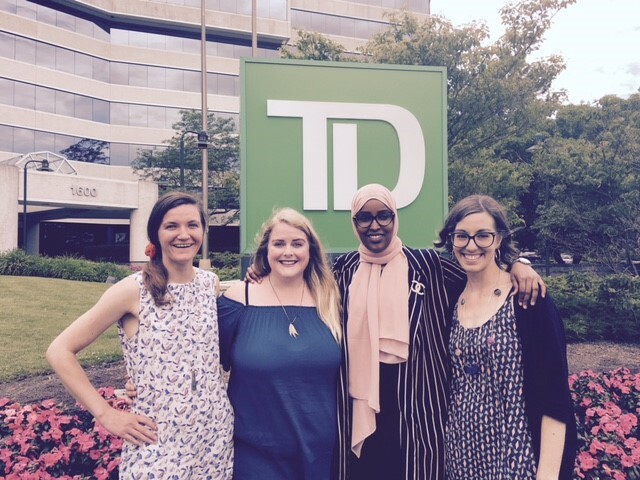 Over the last two years we have received grants in recognition of the volunteer work done by four dedicated Customer Account Specialists at MBNA : Monique Wiley, Mulki Nur, Brittaney Chivers and Nicole Bing. Each of these grants has been a welcome gift to our organization and supports the work we do in the community. Brittaney Chivers is the volunteer team leader for this corporate delivery group and has been volunteering with Meals on Wheels herself for 6 years. She organizes the delivery schedules for her team. Brittaney enjoys the time she spends scheduling her team as it allows her to connect with her colleagues outside of an office context. Of course, her favourite part of the volunteer position includes her interactions with the clients. While on route with her fellow volunteer team member, Mulki Nur, she admits they do have a few favourite clients they enjoy visiting and who provide them with a special sense of appreciation. Likewise Mulki cites memorable moments on route are specifically linked to her time and interactions with clients, specifically citing one moment that stands out, when they were able to give an extra meal to a client. “He was genuinely so grateful. It was nice to see how this makes him so happy”. It is easy to see that the direct interaction and positive impact they have on clients is a win-win opportunity for these employees and the clients served by Meals on Wheels. The MBNA group has found that rather than interfering with their work productivity, volunteering has actually made parts of their job easier. As a Customer Account Specialist, Nicole Bing has found that her involvement with Meals on Wheels has strengthened her connection with senior and more vulnerable community members, helping her better relate to her banking clients. Are you looking to become delivery volunteers for Meals on Wheels with your co-workers? If you are interested, in becoming a Corporate Delivery Team please do not hesitate to reach us. We would be more than happy to answer any questions you may have. Please direct your inquiries to Manager of Volunteer Services Jill Dodd directly either by email at jill@mealsonwheels-ottawa.org or by phone at 613-233-2424. The number of employees on your team will determine the frequency of meal delivery routes. Please call us to discuss our corporate volunteer opportunities, which can be customized to fit your needs!